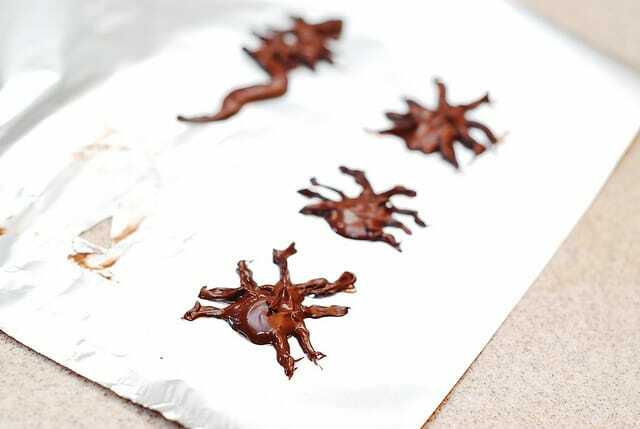 Use melted dark chocolate to make spooky Halloween chocolate bugs, snakes, spiders, worms. The only ingredient you need for this recipe is dark chocolate! 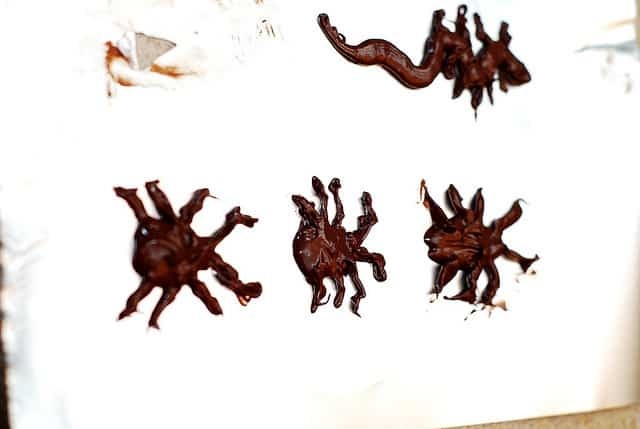 You can then use these chocolate bugs as decoration on Halloween pastries and desserts. For this Halloween, I didn’t want to make any disgusting looking desserts (such as bleeding eyeballs or intestines), just something spooky and easy. 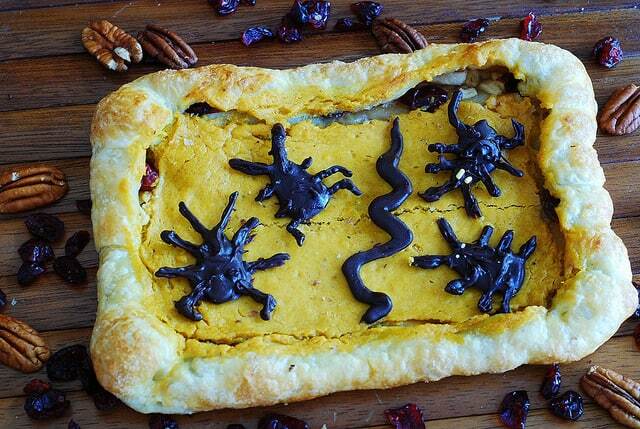 So, my solution was to decorate all of my MANY-MANY Fall-themed desserts (that I don’t seem to be able to stop baking) with spooky bugs made out of chocolate. 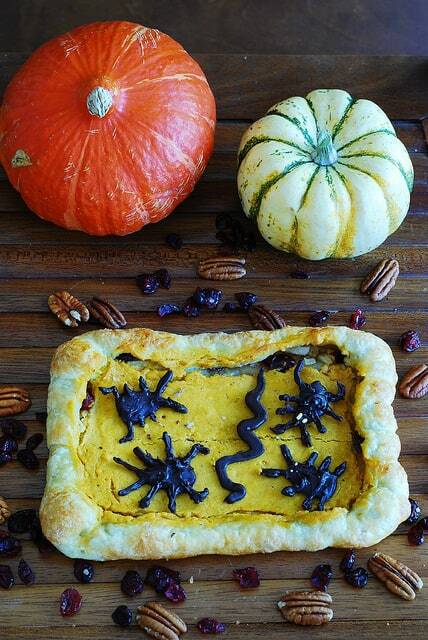 What do you need to make spooky Halloween chocolate bugs, spiders, warms, and snakes? 1) Line a baking sheet with parchment paper. 2) Place 1/2 cup of semi-sweet chocolate chips (or 1 dark chocolate bar) in a pan over medium heat and melt. 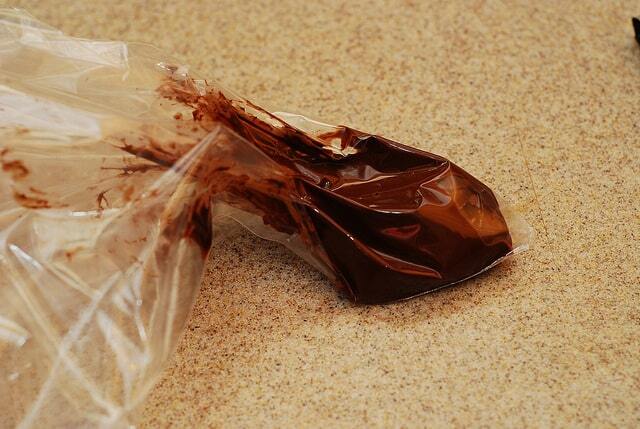 3) Carefully pour melted chocolate into a plastic freezer bag. Cut a small hole at the end of the bag. I recommend using 2 bags: one with the smaller hole, another – with the bigger hole. Use the bag with the bigger hole to draw bigger bugs, and the bag with the smaller hole – for smaller bugs. It is also easier to use the bag with the bigger whole to draw the bodies of bugs, and the bag with smaller hole – to draw legs, tails, etc. 4) Draw bugs, snakes, worms, anything you like – on parchment paper. You can even add little eyes by using cake decorations. It’s surprisingly easy to draw chocolate bugs even if you’ve never done it before. The shapes are pretty basic. Just draw a bulky body, then legs coming from both sides. 5) Place the baking sheet with chocolate bugs in the freezer for at least 40 minutes or longer (until you are ready to use the bugs). CREEPY, CREEPY, CREEPY!!! 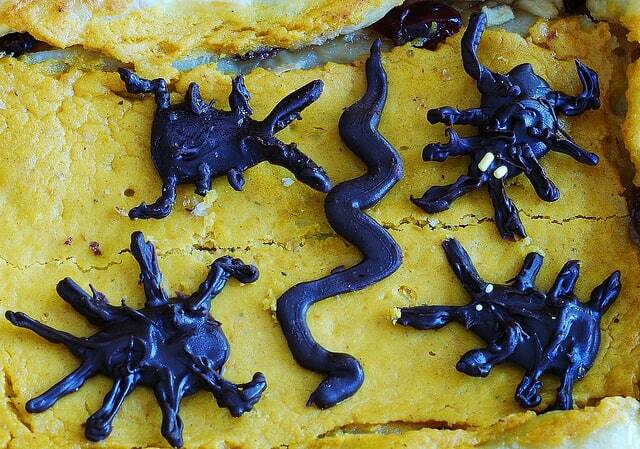 Use these chocolate bugs on Halloween pastries and desserts. Place 1/2 cup of semi-sweet chocolate chips (or 1 dark chocolate bar) in a pan over medium heat and melt. Carefully pour melted chocolate into a plastic freezer bag. Cut a small hole at the end of the bag. I recommend using 2 bags: one with the smaller hole, another – with the bigger hole. Use the bag with the bigger hole to draw bigger bugs, and the bag with the smaller hole – for smaller bugs. It is also easier to use the bag with the bigger whole to draw the bodies of bugs, and the bag with smaller hole – to draw legs, tails, etc. Draw bugs, snakes, worms, anything you like – on parchment paper. You can even add little eyes by using cake decorations. It’s surprisingly easy to draw chocolate bugs even if you’ve never done it before. The shapes are pretty basic. Just draw a bulky body, then legs. 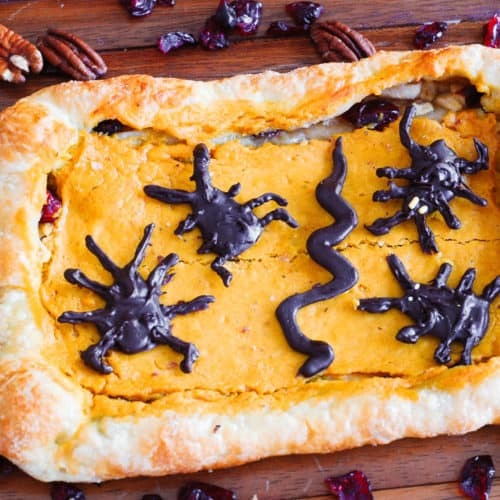 Place baking sheet with chocolate bugs in the freezer for at least 40 minutes or longer (until you are ready to use the bugs). Thank you! These are really easy to make.